The Bent Creek Experimental Forest is the oldest federal experimental forest east of the Mississippi river. It encompasses nearly 6,000 acres within the Pisgah National Forest near Asheville, North Carolina. It was established in 1925 for the purpose of conducting research on silvicultural practices that would aid in the rehabilitation of cutover, abused lands and promote sustainable forestry, and also to provide a field demonstration of forest management practices. Long-term and current research conducted at the Bent Creek Experimental Forest provides land managers with science-based information and methods to meet their forest management and restoration goals. Demonstration areas and research studies at the Bent Creek Experimental Forest provide a hands-on way to see the results of different forest management practices and deliver new research findings to land managers, landowners, researchers, students, and the general public. Through experimental field studies and modeling, our research program focuses on understanding and predicting how upland hardwood-dominated forests and wildlife communities are affected by natural disturbances and shaped by silvicultural activities. 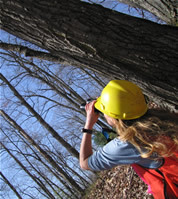 Scientists at the Bent Creek Experimental Forest currently study oak ecosystem restoration, hardwood regeneration, fire ecology, growth and yield, forest stand dynamics, acorn and native forest fruit production, invasive plant species, American chestnut restoration, wildlife response to forest management practices, and ecosystem classification. We also study how forest composition, regeneration, and productivity differ across changing environmental conditions such as moisture and fertility gradients associated with the varied topography and geology of the southern Appalachians and the greater upland hardwood forest region. Long-term studies, some established more than 80 years ago, are still yielding valuable information on forest stand development, stand dynamics, and timber growth and yield. Today some of those studies are being used to address current issues such as climate change mitigation through carbon sequestration. Our applied research has important implications for sustainable forest management, wildlife and habitat quality, and forest restoration, and for emerging issues such as invasive species, effects of prescribed fire on upland hardwood ecosystems, forest restoration, and climate change mitigation through carbon sequestration. Please visit our research and products & pubs link for additional information on past and current research. Our research partners and collaborators include universities and colleges, state forestry and wildlife agencies, national forests, and many others. 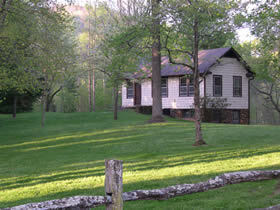 Bent Creek Experimental Forest was established to conduct research and educate natural resource professionals and others about forest management in the southern Appalachians. Demonstration areas showing silvicultural treatments and forest management practices are located on the forest. Interpretive signs are located along the demonstration forest and along trails (PDF). 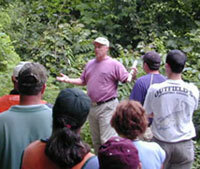 Customized tours can be arranged in advance for groups interested in learning about forest management practices and research at Bent Creek Experimental Forest. Lake Powhatan recreation area and the NC Arboretum are located within the experimental forest boundaries. The Blue Ridge Parkway borders the Bent Creek Experimental Forest to the east and south. There are over 44 miles of trails within the Bent Creek Experimental Forest. Mountain bikes and horses are permitted only on designated trails. Please visit the Recreation link for more details.